Beat Detection iExpressions can be applied to properties which represent the audio amplitude of some music (i.e. 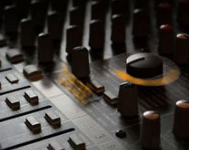 properties which you created with the function 'convert audio into keyframes' of the keyframe assistent). They can detect the beats in the music such that you can animate various properties according to the music. The beat detectors just recognize the beat and don't do any animation, yet. You can animate properties using other iExpressions (like the 'Change on Beat 1D') which are then linked to the beat detector. This setup allows to animate several properties according to the same beat. 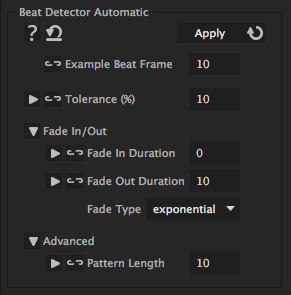 To use the beat detector automatic, you just have to provide one example frame where the music contains a beat and the iExpression automatically searches for all other places where the wave form looks very similar. Theses are then also considered to be beats. This works in particular well, if the beats are clearly visible in the wave form of the audio. determines how similar other parts must be to the given example beat in order to be identified as beat, too. The lower this number, the less beats are detected. A tolerance of 0 means that other parts are identified as beats only, if they have exactly the same audio amplitude as the example beat. determines the length of the beat in number of frames. 10 means, for example, that the 10 frames around the given example beat are compared to other audio amplitude of remaining parts in order to find the other occurences of the beat.